The only tough thing about a Weim is you don’t own the couch anymore….they do!!! You might remember this little girl earlier this year during our resolution-making season. Click here to see her then, and to read more about her and the sofa. You might also like to know that she is a sister to Luke and Bo–featured yesterday. We hear that Schatzi and the two blue boys are planning a play date sometime in the future. The couch is shared in most every household despite efforts to prevent this from happening. Some do, but most don’t even attempt it. You might remember that Weimar rule list that used to be prevalent. It would start off where the Weimar is not going to come into the house. (Oops–then we are not placing a pup with you.) 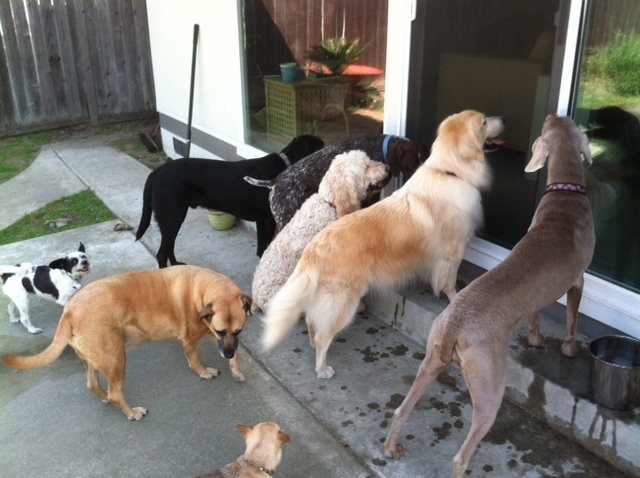 Then, it would quickly follow up, with–alright the Weimar is allowed in the house, but only by the back door. And this would go on and on, and pretty soon the Weim owned the house and was running things. (Ha!) We tend to share almost everything with our Weimaraners. Don’t you agree? So, the sofa is in use. Well, if the human arrives first, they are welcome to be used as a pillow. Otherwise, you might have to try to squeeze in somewhere or opt for the recliner. This has been happening for awhile now. Weimlovers gather at Nancy’s place for fun bringing the fur family members. Last Sunday was the May Playdate. Nancy writes–for anyone who may be new 🙂 Plan to come and be dazzled by all the weimies, it’s kind of magical. The property is completely fenced with plenty of room to run, hunt or wrestle around. The Weimer’s pets typically share a meal, this time we are doing salads, finger foods or desserts. We will provide iced tea, water and we also have a German beer on tap! If you would like anything else to drink please bring it! When you arrive, you can either walk right into the house (no need to knock!) or you can also go straight to the back there is a gate at the back of the garage. I have no problem with dogs in the house & PLEASE don’t take your shoes off, there’s just no need to do that! 🙂 Hope you can join us!! If you want to get in on the fun, contact Nancy ( nancy@garinmaintenance.com ) and she will get you the information on the next event. Hope you join in the fun! The kids had a fun play day today. They are all waiting for a treat!! Some more patient than others. They are: Lucy, Luigi, Dolly( labradoodle), Dieter (German Shorthair), Wooley (Black Lab) Daisy (Chiuhauha), Meg (mix rescue dog) and Jena ( black and white terrier mix rescue dog). It was a great time!! I hope you had a nice day. Breeder’s Note: Lucy’s parents have a private caregiver who visits their home. She makes house calls, takes her clients on walks, has play dates, and does what she can do to assist Lucy’s parents. When they go out of town for much-needed respite, she is there for Lucy (and Luigi–her Golden brother pictured next to her). Many people find the need to for additional caregivers (or daycare) for their Weimaraner. The reasons vary greatly, but often are due to work schedules more than any other factor. Success is mixed. Some Weims pick up bad habits at the daycare center. For example, some allow for inside potty areas. The Weimaraner arrives home (from their fun day where it was perfectly OK to urinate on the wall–because it is easily washed down the drain) to find their family not being happy with that behavior. Finding the best solution (if you need one) is important. Lucy and Luigi have the perfect in-home care situation.